HD44780 based character LCD is a de facto industry standard LCD that is used in many designs such as clocks, robots and microcontroller boards. It is readily available from most electronic stores and EBay. Although this LCD is relatively easy to use, however interfacing with this LCD normally requires 6-10 IO pins for 4 bit and 8 bit mode respectively. 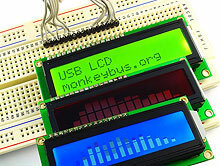 With most PC no longer built with a parallel port, interfacing with this LCD requires a USB / Serial to LCD interface. 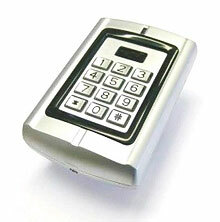 Access control using a numeric keyboard, radio frequency identification (RFID) or combination of both are widely used in the security and access control industry. These types of devices are affordable, robust and simple to install. The RFID itself comes in various shape and sizes containing two sets of information combined to create a unique credential; the facility code of the card and the card ID. This tutorial shows how to use the MonkeyBUS to interpret signals from RFID readers and determine RFID’s facility code and card ID whilst exploring several important aspects of the PIC18F14K50 microcontroller.